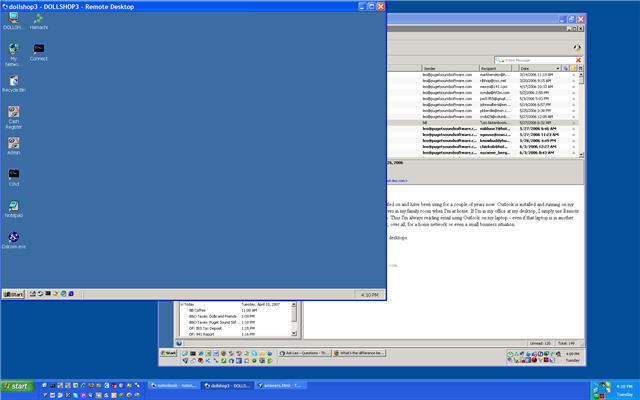 Remote Desktop allows you to use your Windows machine remotely, almost as if sitting in front of it. Coupled with a VPN solution, it's very powerful. I've seen you reference something called "Remote Desktop", apparently it's something you use a lot. Just what is it? Remote Desktop is, pretty much, what it sounds like: the ability to access the desktop of one computer from another. But words don't do it justice, so let's do some words and pictures and see if we can't make the concept clearer. As I type this I'm using my "main" desktop computer. One of the windows open on my screen is of course the editing program I'm using to write this article. Another window has a browser, another has a command shell, and so on. One window has the desktop of another computer within it. I keep my email on my laptop, but my laptop is in another room. Hence I use Remote Desktop to access that computer "remotely" from the computer in my office. The entire image is a snapshot of what's on my office computer. The window in the middle is a Remote Desktop connection to my laptop in the other room. The grey menu bar at the bottom of that window, and the icons you can partially see on the left side of that window, are those of the laptop. The program you see running within that window is my email program, Thunderbird, which is running on my laptop. The bottom line is that using a remote desktop connection I can use my laptop almost as if I were sitting in front of it, even if it's in another room. This time I've opened a Remote Desktop connection to a computer not even in my home. This computer, running Windows 2000, is 10 miles to the south of me at my wife's place of business. And yet, I can use it almost as if I were sitting in front of it. 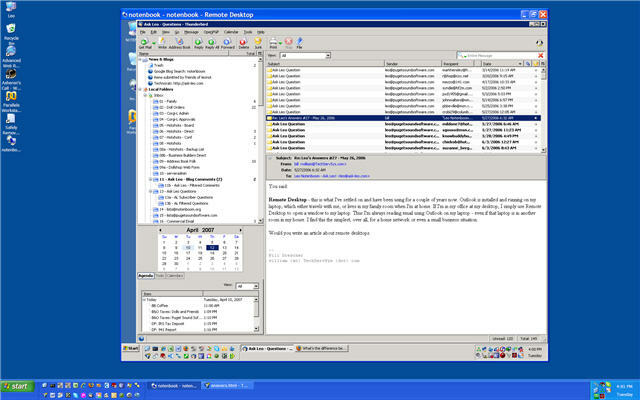 Remote Desktop uses a client application that you run on your local computer. That computer can be almost anything from Windows 98 on up. There's a Remote Desktop client for the Mac, and it wouldn't surprise me if there were one for Linux. Remote Desktop requires that a particular service be running and enabled on the remote computer. This is either the Remote Desktop service, or "Terminal Services". Remote Desktop is available on Windows XP Pro, but not Home. Terminal Services is available on Windows 2000 and 2003 Server. "The biggest issue most people face is knowing what to connect to." One important difference between the two: when you access a Windows XP Pro machine using Remote Desktop the "real" screen and keyboard are switched away from; meaning that only one person can use the computer at a time. If the someone logs in at the real console, the Remote Desktop session is closed. If someone logs in via Remote Desktop, the console session is suspended. In both cases if the person is logging in with the same account as the active session, that session is simply "moved" from console to remote, or from remote to console. With Terminal Services, more than one remote session can be established simultaneously, and the console is not affected. Multiple people can use the same machine at the same time. You enable Remote Desktop on your Windows XP system by right-clicking on My Computer, clicking on Properties and then clicking on the Remote tab. Therein is a checkbox Allow users to connect remotely to this computer. You may also need to open the incoming Remote Desktop port (3389 by default) in any firewall you have running on that machine. This is all done on the remote computer to enable it to be accessed remotely. For example this is what I did on my laptop. The remote desktop client is typically already on your Windows XP machine, in All Programs, Accessories, Communication. Other versions can be downloaded from Microsoft. The biggest issue most people face is knowing what to connect to. If you're connecting to another machine on your local network, you can specify it by name or by IP address. If you're connecting over the internet, things get a little more complicated, particularly if the machine you want to connect to is behind a router. My favorite solution is to use Hamachi to set up a VPN or Virtual Private Network so that all the machines "look like" they're on my local LAN, no matter where they are. Then I can establish a remote desktop connection to the machines by name or by IP, just as if they really were on my local LAN. You would specify the internet IP address of the remote machine's router to the Remote Desktop Client. You cannot specify the IP address of the machine itself, say a 192.168... address because that is not a valid internet IP address, only a local LAN address. The router needs to forward port 3389 to the computer you want to connect to. Exactly how you perform port forwarding will vary based on your router, but this is typically where you specify that local "192.168" address, using it to tell the router that this is where you want Remote Desktop Connections that come in off the internet to connect to. Note that by using port forwarding like this, you can specify only one machine to connect to. It's possible, though somewhat complicated, to set up different ports in addition to 3389, and have each such port represent a different computer on your LAN that can be connected to. Note also that port forwarding is done by specifying the IP address of the target computer. That means if you use DHCP on that LAN to assign IP addresses, the address could change, and the forward might need to be reconfigured to use the newly assigned address. Assigning static addresses on your LAN is one solution, but well beyond the scope of this article. By now you can see why a VPN solution such as Hamachi is so lucrative to me. No port forwarding or router games need be played at all. Download the video: tip8.mp4 (6M). Recommendation: Hamachi - Simple Remote Access VPN Hamachi is a free, easy-to-use VPN that allows you to connect machines across the internet as if they were right there on your local network. Recommendation: TightVNC free remote control - a remote desktop alternative for Windows XP Home and others. How Can I access my Windows XP Machine Remotely? Windows XP Pro includes functionality to access the computer's desktop across a network. Remote Desktop must be enabled and configured properly. Microsoft - Working Remotely with Windows XP includes several articles on Remote Desktop. There are many different Linux clients to connect to RDP (RDP is the Microsoft protocol used for Remote Desktop & Terminal Services) hosts. RDP was changed in Vista, and an updated client is now available for all Windows versions but I'm not sure if those updates have been ported to Linux but if not yet it won't be long. Many Linux distributions come by default with a remote desktop client so its not difficult to find one. I appreciate your help on the net. It was indeed helpful to know the need of a VPN in order to connect the RDP. Thank u. 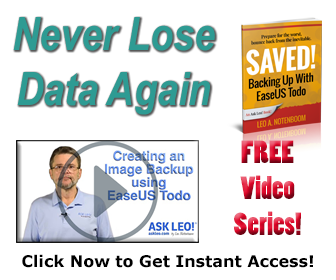 Can my xp pro laptop access Vista ultimate over the Internet? Using WinXP Pro at HP. What do I do if Remote Desktop Connection (RDC)is not available in Start>All Programs>Accessories>Communications> on my Win XP Pro system at work. I have downloaded and installed RDC from the MS site and rebooted but it still doesn't show up in ...Accessories>Communications>. I need RDC to connect to a reporting server that I have just been given access to. How do I launch RDC if it doesn't show up there? Yesterday I installed a new Belkin G Wireless Router on my XP Home system. I uaes the cd, followed instructions, everything worked. I also inst a wireless network adapted downstairs on my other computer. It worked. Then suddenly, the downstairs system stopped working. It was late, I went to bed. Tonight when I came home and started the XP upstairs there was no internet access. The program was gone! The files, the desktop icon, everything was gone. I did not uninstall the program. It had to be done remotely. I have checked the remote properties and see that they have been set to Allow this computer to be controlled remotely for 30 days! Please assist. I cannot think of any reason why I would need my computer to be controlled remotely. Does the remote desktop screen get "blanked" out to other people that are physically in the same location as the remote computer? In other words, if someone is walking by, can they see what I am working on from my remote location? When using remote desktop the physical screen shows the login screen. If someone logs in the remote desktop is disconnected, and the person logging in can see whatever was happening at that time.